Completed in June 2013, Gensler’s the new 60,000-square-foot workplace exposes clients and guests to the design process when they walk in the door. Designers are working in an open studio space in the storefront area where passersby can easily view our design process in action. The Washington Conference room is on the ground floor of our recently expanded office at 2020 K Street, NW. 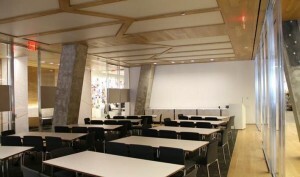 In addition to the multi-purpose conference room, the ground floor offers a cafe area and small team meeting spaces in a well-lit and modern environment.. We can accommodate multiple different group sizes based on the different room layouts Gensler is open from 8:30 am to 5:30 pm but can host events outside those hours as long as our support team is available. Gensler is pleased to offer our Washington Conference room to professional and allied organizations in which Gensler staff members are active participants. Rates and fees may apply for use of space and services offered. For more information on this, please contact Meredith Flanagan (meredith_flanagan@gensler.com). Catering is available from a list of approved caterers.